Fukushima Prefecture (福島県, Fukushima-ken) is a prefecture of Japan located in the Tōhoku region. The capital is the city of Fukushima. 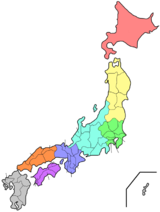 This region of Japan is also known as Michinoku and Ōshū. The 2011 Tōhoku earthquake and tsunami and the resulting Fukushima Daiichi nuclear disaster caused significant damage to the prefecture, primarily but not limited to the eastern Hamadōri region. Fukushima is both the southernmost prefecture of Tōhoku region and the prefecture of Tōhoku region that is closest to Tokyo. With an area size of 13,784 km2 it is the third-largest prefecture of Japan, behind Hokkaido and Iwate Prefecture. It is divided by mountain ranges into three regions called (from west to east) Aizu, Nakadōri, and Hamadōri. Lacquerware is another popular product from Fukushima. Dating back over four hundred years, the process of making lacquerware involves carving an object out of wood, then putting a lacquer on it and decorating it. Objects made are usually dishes, vases and writing materials. Other stories, such as that of a large, strong, red cow that carried wood, influenced toys and superstitions. The Aka-beko cow is a small, red papier-mâché cow on a bamboo or wooden frame, and is believed to ease child birth, bring good health, and help children grow up as strong as the cow. Another superstitious talisman of the region is the okiagari ko-boshi, or self-righting dharma doll. These dolls are seen as bringers of good luck and prosperity because they stand right back up when knocked down. Sōma's Nomaoi Festival (相馬野馬追, Sōma Nomaoi) is held every summer. The Nomaoi Festival horse riders dressed in complete samurai attire can be seen racing, chasing wild horses, or having contests that imitate a battle. The history behind the festival and events is over one thousand years old. During the Waraji Festival, a large (12-meter, 38-ft) straw sandal built by locals is dedicated to a shrine. There is also a traditional Taiwanese dragon dance, or Ryumai, performed by Taiwanese visitors. The Aizu festival is a celebration of the time of the samurai. It begins with a display of sword dancing and fighting, and is followed by a procession of around five hundred people. The people in the procession carry flags and tools representing well-known feudal lords of long ago, and some are actually dressed like the lords themselves. Kōriyama City's Uneme Festival (うねめ祭り）is held early August in honor of the legend of Princess Uneme. The festival features a large parade through the city center with thousands of contestants annually, with several festival floats and a giant taiko-drum. Date City's Ryozen Taiko Festival (霊山太鼓祭り) is held in August and features multiple troupes of taiko drum players as well as other musical and comedic performances. Kitakata is well known for its distinctive Kitakata ramen noodles and well-preserved traditional storehouse buildings, while Ōuchi-juku in the town of Shimogo retains numerous thatched buildings from the Edo period. The Inawashiro Lake area of Bandai-Asahi National Park is Inawashiro-ko, where the parental home of Hideyo Noguchi (1876–1928) can still be found. It was preserved along with some of Noguchi's belongings and letters as part of a memorial. Noguchi is famous not only for his research on yellow fever, but also for having his face on the 1,000 yen note. Mamador is the prefecture's most famous confection. The baked good has a milky red bean flavor center wrapped in a buttery dough. The name means “People who drink mothers’ milk" in Spanish. It is produced by the Sanmangoku Company. Junko Tabei, the first woman to reach the summit of Mount Everest, and the first woman to ascend all Seven Summits by climbing the highest peak on every continent. Takeshi Suzuki, an alpine skier and Paralympic athlete. Yoshihide Muroya, an aerobatics pilot and race pilot. Toshiyuki Nishida, an actor best known for his fishing comedy series, Tsuribaka Nisshi ("The Fishing Maniac's Diary"). Seishiro Okazaki (January 28, 1890 – July 12, 1951) was a Japanese American healer, martial artist, and founder of Danzan-ryū jujitsu. Born in Kakeda, Date County in Fukushima Prefecture, Japan, he immigrated to Hawaii in 1906. ^ "福島県の推計人口". Fukushima Prefecture. Retrieved January 25, 2018. ^ Takeda, Toru et al. (2001). Fukushima – Today & Tomorrow, p. 10. ^ "Felt earthquakes" (PDF). Japan Meteorological Agency. Retrieved August 23, 2011. ^ "東北・関東７県で貯水池、農業用ダムの損傷８６カ所　補修予算わずか１億、不安募る梅雨". msn産経ニュース. Archived from the original on August 26, 2011. Retrieved June 29, 2011. ^ "新たに女性遺体を発見　白河の土砂崩れ". 47NEWS. Archived from the original on November 25, 2011. Retrieved June 29, 2011. ^ "Damage Situation and Police Countermeasures... March 11, 2013" National Police Agency of Japan. Retrieved March 18, 2013. ^ "Japan quake: Radiation rises at Fukushima nuclear plant". BBC News. March 15, 2011. ^ "Fukushima crisis raised to level 7, still no Chernobyl". New Scientist. April 12, 2011. ^ "Fukushima accident". Encyclopædia Britannica. Retrieved February 17, 2019. ^ "General overview of area figures for Natural Parks by prefecture" (PDF). Ministry of the Environment. Retrieved August 26, 2012. ^ a b "Fukushima City". Japan National Tourism Organization. Archived from the original on September 25, 2017. ^ Schreiber, Mark, "Japan's food crisis goes beyond recent panic buying Archived April 20, 2011, at the Wayback Machine", The Japan Times, April 17, 2011, p. 9. ^ Hongo, Jun, "Fukushima not just about nuke crisis", The Japan Times, March 20, 2012, p. 3. ^ a b "Aizuwakamatsu Area". Japan National Tourism Organization. Archived from the original on July 14, 2017. ^ "Aizu lacquerware". Fukushima Prefecture Tourism & Local Products Association. Retrieved February 17, 2019. ^ "Make Your Own Aizu Lacquerware Chopsticks". Rediscover Fukushima. June 20, 2018. Retrieved February 17, 2019. ^ "Akabeko Red Cows". Fukushima Prefecture Tourism & Local Products Association. Retrieved February 17, 2019. ^ "Okiagari Ko-boshi (self-righting dharma doll)". Fukushima Prefecture Tourism & Local Products Association. Retrieved February 17, 2019. ^ "Miharu Koma". Fukushima Prefecture Tourism & Local Products Association. Retrieved February 17, 2019. ^ "Soma Nomaoi Executive Committee Official Site". Soma Nomaoi Executive Committee. Retrieved October 1, 2017. ^ "The Soma Nomaoi". Fukushima Prefecture Tourism & Local Products Association. Retrieved February 17, 2019. ^ わらじまつり (in Japanese). 福島わらじまつり実行委員会事務局. Retrieved June 30, 2011. ^ "Fukushima Waraji Festival". Fukushima Prefecture Tourism & Local Products Association. Retrieved February 17, 2019. ^ 会津まつり　先人感謝祭・会津藩公行列 (in Japanese). 会津若松観光物産協会. Retrieved March 20, 2012. ^ "Aizu Festival". Fukushima Prefecture Tourism & Local Products Association. Retrieved February 17, 2019. ^ "Taimatsu Akashi". Fukushima Prefecture Tourism & Local Products Association. Retrieved February 17, 2019. ^ けんか祭りの飯坂八幡神社 (in Japanese). Retrieved June 30, 2011. ^ 二本松の菊人形 (in Japanese). 二本松菊栄会. Archived from the original on July 23, 2011. Retrieved June 30, 2011. ^ "第53回郡山うねめまつり2017". www.ko-cci.or.jp. Retrieved January 25, 2018. ^ 霊山太鼓保存会. "太鼓まつり｜霊山太鼓". www5e.biglobe.ne.jp (in Japanese). Retrieved November 13, 2018. ^ "Ura-bandai Area". Japan National Tourism Organization. Archived from the original on August 15, 2017. ^ "Lake Inawashiro Area". Japan National Tourism Organization. Archived from the original on November 10, 2017. ^ a b "フルーツを食す – 福島市ホームページ". www.city.fukushima.fukushima.jp. Archived from the original on October 24, 2016. Retrieved October 24, 2016. ^ "福島牛販売促進協議会". www.fukushima-gyu.com. Retrieved October 24, 2016. ^ 羽雁渉「イカと日本人」Chunichi Newspaper, Sunday edition.世界と日本 大図解シリーズ No.1272. October 9, 2016 、pages 1, 8 (in Japanese). ^ a b "Kitakata ramen". NHK WORLD. June 20, 2016. Retrieved October 24, 2016. ^ "福島の人気お土産50選｜ままどおるだけじゃない！福島のおすすめお菓子-カウモ". カウモ. Retrieved October 24, 2016. ^ "ままどおる｜三万石". www.sanmangoku.co.jp. Retrieved October 24, 2016. ^ "蔵元検索 | 福島県酒造協同組合". sake-fukushima.jp. Retrieved October 24, 2016. ^ "祝！！４連覇　平成２７酒造年度全国新酒鑑評会金賞受賞蔵数　日本一！！ | 福島県酒造協同組合". sake-fukushima.jp. Retrieved October 24, 2016. ^ "Hideyo Noguchi Africa Prize". Cabinet Office, Government of Japan. Retrieved August 4, 2011. Takeda, Toru; Hishinuma, Tomio; Oguma, Chiyoichi; Takiguchi, R. (July 7, 2001). "Fukushima – Today & Tomorrow". Aizu-Wakamatsu City: Rekishi Shunju Publishing Co. ISBN 4-89757-432-3. Wikivoyage has a travel guide for Fukushima (prefecture). Wikimedia Commons has media related to Fukushima prefecture.